So, it was only the first round of the 2012 Memorial tournament. But I thought it was going to be pretty exciting to watch the group of Mickelson, Fowler and Watson. It was almost painful to watch and I’m sure Fowler felt the same. Everyone was talking about how fast and slippery the greens were, the course was playing tough. The word frustrated was all I kept hearing from the announcers when both Watson and Mickelson missed fairways, found bunker after bunker and even followed each other into the water on the par 3 16th. It was really hard to watch, like watching a 4 hour car crash. Phil had that look on his face, playing with absolutely no Mojo, no magical shots and that every present smile wasn’t on his face yesterday. He finally got back to the club house shooting a 7 over 79, did I say it was tough to watch. Now Bubba Watson looked to out of sorts too. Frustrated with golf shot after golf shot claiming to be rusty from lack of tournament play. Again, finding bunkers, water and few fairways, bogie on the par 5 11th – Bubba struggled to get in with a 3 over 75 -just 4 shots better than his playing companion Phil. Yeah, the green were fast, I heard they were rolling at a 14 – but that didn’t look like either of their problems during the first round yesterday at the Memorial. It must have been tough for Fowler to keep his focus while he watched a couple of his friends come unglued on the course. He traded birdies for bogies, had an eagle on the par 5 – 11th and then a bogie on the other par 5 – 15th he went out in 36 coming in with a 1 under 35. That’s where he stands after the first day. Curious as to what happened with Mickelson’s game I find out he WD — are you kidding me he withdrew because of fatigue, too much travel and a family vacation to Italy and France. That’s a first, not a wrist or back injury, but fatigue. He probably thought he wouldn’t make the cut anyway, oh well -gotta get ready for the U.S. Open. Maybe Ricky and Bubba will gel a bit better today without Phil around, we’ll see. The second round should be fun to watch, would like to see Spencer Levin play well today he’s right in there at 6 under. Or, who knows maybe come Sunday it’ll be Tiger Woods again. Learning how to shape your golf shots (hit a draw or fade when you want to) is crucial if you want to take your golf game to the next level. Being able to shape your golf shots will enable you to recover from a sliced tee shot with a beautiful fade out of the rough, and on to the fairway or green. Mastering these shots will enable you to miss-hit the occasional tee shot and still beat your buddies on that hole. 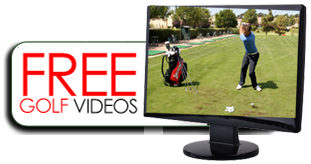 In this short video Golf Professional Mike Gorton will show you the secrets to shaping your shots without changing how you swing. As you can see from this video once you know the tricks shaping your shots is really pretty simple. The key is understanding the two key variables that affect where the golf ball goes. 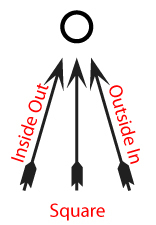 The first variable is the way the club approaches the ball (inside out, outside in, or square). The diagram to the right shows these angles in case you are having trouble visualizing this (note: the diagram on the right is for a right handed golfer, it would be opposite for lefties). The second variable is the position of the club head (open, closed, or square). In order to shape your shots you simply need to change your stance. Changing your stance (opening up or closing up your stance) will cause you to chance your swing path without even having to think about it. As Mike explains in the video all you need to do is open your stance while still aiming at your target. By opening your stance you force yourself to make an outside in swing which puts right hand spin on the ball resulting in a fade. To hit a draw you need to close your stance while still aiming at the target. This will force you to have an inside out swing path. This swing path will put left hand spin on the ball causing your golf shot to draw to the left. Practice these shots on the range to get a feel for how much you need to open and close your stance to get the amount of movement you are looking for. These shots are actually a lot of fun to practice so grab a bucket of balls and hit the range. For more tips from 3 time Long Drive World Champ Mike Gorton check out his Bombing it Long Package. When was the last time you hit the golf ball way over the green on an approach shot? You probably don’t remember because for most amateur golfers over shooting the green is rarely a problem. Let me ask you another question. When was the last time your approach shot fell short of the green? You probably do remember because it was the last time you played golf. This is why golf course architects put the majority of hazards (bunker, water, ravines) in front of the green not behind it. Why am I asking you these questions? Well I’m trying to show you all the strokes you are adding to your score simply because you are using the wrong club. Yep that’s right. Most golfers are using the wrong club for approach shots. It doesn’t matter if you are 180 yards out or 100 yards out you are probably over estimating the distance of your golf clubs. 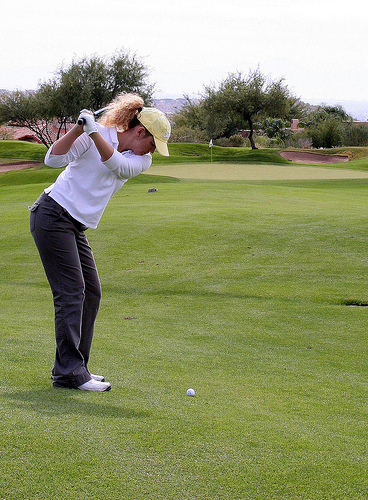 Most handicap golfers don’t hit the ball as far as they think they do. This is one of the simplest problems in golf to fix. The secret solution: use one club higher on your approach shots. Yeah we’ve all hit that career best 180 yard 7 iron with 30 mph wind at our backs and a downhill roll. But let be honest this was a once in a life shot. If your instinct tells you to grab your seven iron grab your six instead. Pretty simple stuff I’m sure you will agree. The beauty is that you can literally start slashing your golf scores over night using this simple trick (you don’t even have to change the way you swing). There are a lot of golfers out there who have good golf swings, hit the ball solid most of the time yet get frustrated with their high scores wondering why. They usually end up thinking that they need to hit the ball harder to make it on the green (ruining the rhythm of their swing). Why work harder when you can work smarter. There is no shame in using a longer club (especially when you are the only guy making it on the green without a chip shot). There is no point in overestimating the distance of your golf shot. Yet we all have a tendency to do this. We all remember those perfect shots we have made and boy did that feel good. The problem is we can’t do this on every shot. The truth is you may hit the ball 180 once in a blue moon, but your average is around 150. So why not just use a six iron with a nice controlled and relaxed swing? 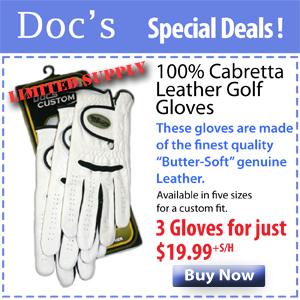 Play your golf clubs to their average distance not their max and you scores will start dropping big time.